Went up to my first football match of the year by train. It was Bristol City versus Sheffield Wednesday in the FA Cup at Ashton Gate. Had to go to Uxbrdige with my work, so went by Metropolitan Line from Aldgate. Took about an hour to get there by tube. Not one rail trip made by me this month! One was planned but had to be cancelled due to illness. However I more than made it for it with my travels in March!!!! 1/3/11 Leigh-on-Sea to London Fenchurch Street. London Kings Cross to Darlington. Darlington to Middlesbrough. After a month off from travelling on Britain's trains, it's back with a vengeance for March. I have to go up to Middlesbrough with my work, but fit it in when Middlesbrough re playing at home - to Nottingham Forest. I was hoping to go on the Weardale Railway whilst I was up there, but unfortunately it was shut for maintenance on the day I was visiting. 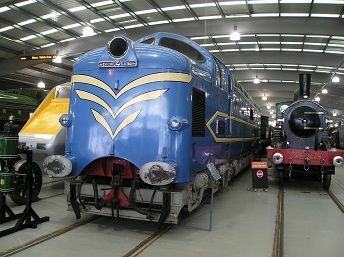 However, I did time my return journey so I could visit Locomotion at Shildon before I returned south. At King's Cross my Newcastle bound train, the 12.30pm, was actually an East Midlands Class ??? DMU, due to lack of stock. The journey up was fine until just before we got to Doncaster. We were held just south of the station due to a "Health and Safety" issue. Apparently someone had noticed some loose bricks on a bridge just north of Doncaster and we had to wait for someone to come and "inspect" them before we could proceed. This meant a delay of almost thirty minutes, so I arrived at Darlington late and had to get the next train across to Middlesbrough. To gv ie the train uard his due, he did look up for me to see if would be quicker to change to a Trans Pennine train at York, but it wasn't. So I stayed on. 2/3/11 Middlesbrough to Bishop Auckland. Bishop Auckland to Shildon. Shildon to North Road. Darlington to London Kings Cross. London Fenchurch Street to Leigh-on-Sea. The next day I walked from my B and B to Middlesbrough station and got a day return to Bishop Auckland for £6.90?? I chose to go all the way to Bishop Auckland rather than get off at Shildon, as Locomotion didn't open till 10 o'clock and I would have had to wait around quarter of an hour. I was glad I stayed on as they'd painted a nice mural on the station at Bishop Auckland, which wasn't there the last time I was there. I then had about an hour and a half to go round Locomotion, which is a smaller version of York's National Railway Museum, Although it hasn't got a quarter of what York has, it does have the prototype Deltic and Mallard, whose cab you can look into, plus several interesting steam locomotives, including one built at Horwich Loco works, where my Grandfather worked for a time. Plus the museum is free to enter. 5/3/11 Leigh-on-Sea to London Fenchurch Street. London Euston to Lancaster. Lancaster to Preston. Preston to Manchester Piccadilly. Manchester Piccadilly to London Euston. London Fenchurch Street to Leigh-on-Sea. Just three days later and here I am speeding North again. This time I'm going up to Morecambe to see Southend United play. If I'd gone on the fan club coach I would have had to have left Leigh at seven in the morning. By train I leave Leigh just before 10 o'clock to catch the 11.30 from London Euston to Lancaster. For the first time that I can remember I'm actually travelling on an Inter City train without a reservation. So at Euston as soon as the platform number is announced - less than ten minutes before departure time - everyone rushes to get on. As I enter the carriage the electronic signs saying whether the seat is reserved or not is not lit up, so I sit at a table seat facing forward. Then just as the train is about to depart the sign lits up and says reserved for my seat. Luckily no one comes along to say I'm sitting in their seat, but not very good Virgin on the organisational front. The journey passes OK and I get to Lancaster on time. I don't get a train from Lancaster to Morecambe as there is a half hour wait for the next one, so I pay almost a tenner for a taxi. Coming back it's the same option as I have to be at Lancaster station to catch the 17.15 down to Preston. I then travel back to London via Manchester Piccadilly as that was the only route I could get due to booking the train with less than two weeks to go. I do travel first class though as it was only £10 more and actually less than my second class fare on the way up! Yous also get free free tea or coffee and biscuits, crisps and water, which is nice. There's one problem on the way back. Just as we are leaving Wilmslow, someone pulls the communication cord, or "passenger emergency button" as the train guard calls it. We then wait for at least quarter of an hour before the person gets off and the train continues on its journey. We are still fifteen minutes late leaving Crewe, but somehow the driver manages to put on an extra burst of speed, only to beb thwarted by speed restrictions in the Milton Keynes area. So we are twenty minutes last arriving at Euston. Consequently I make it to Fenchurch Street just as my train is leaving, so I have to wait a whole half hour for the next one! 16/3/11 Leigh-on-Sea to London Fenchurch Street and return. Farringdon to Sutton via Tulse Hill. Sutton to London Victoria via Clapham Junction. Went to visit a friend in South London for the day. On my way there we stopped at the currently being refurbished Blackfriars Station, which still looks like a building site and has a long way to go. 23/3/11 Leigh-on-Sea to London Fenchurch Street and return. London Bridge to East Croydon. East Croydon to Fratton via Horsham. Fratton to Southampton Central. Southampton Central to Salisbury. Salisbury to London Waterloo. Had to go down to Portsmouth with my job, so took the opportunity of visiting both Portsmouth and Southampton's football grounds for my football grounds website, as well as going on new track between Southampton and Salisbury. Went to Portsmouth with Southern, taking advantage of their all day rover ticket which only cost £12, which covered the line as far west as Southampton and as far north as Milton Keynes. 29/3/11 Leigh-on-Sea to London Fenchurch Street. London Waterloo to Bournemouth. Bournemouth to Weymouth. Weymouth to Yeovil Pen Mill. 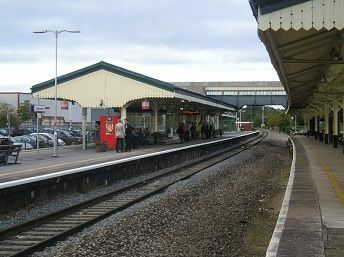 Yeovil Junction to Exeter Central. Exeter Central to St James' Park and return. Exeter Central to St James' Park. Back on my travels to the South West once again, passing through Southampton for the second time in less than a week. My single from Waterloo to Bournemouth was only £16, but for another £1 I could go 1st class, which I did. The journey to Bournemouth was fine, but then going from Bournemouth to Yeovil was one of those once in a while disasters! I was meant to get the 12.24 from Bournemouth to Dorchester South and then change to Dorchester West to go onot Yeovil from there. But when I got back to Bournemouth station, it was announced that mine and other trains from the west were being delayed due to a car hitting a railway bridge at Brockenhurst. Consequently, my train was almost half an hour late leaving Bournemouth and was going to go non-stop between Poole and Weymouth. Of course I would miss my connection in Dorchester, so I decided to go all the way to Weymouth and catch the next train to Yeovil pen Mill from there. the only problem was that soon after Wool, the train came to a complete stop for the next 20 minutes. This was due to a lineside fire in the Dorchester area - well actually just north of ? Tunnel. So we finally arrived in Weymouth just after 2 o'clock. That left me with an hour to kill in Weymouth, so I naturally walked down to the seafront and bought an ice cream, before returning to the station. Although there were around twenty passengers waiting for the 15.08 to Gloucester, the guard didn't open the doors until about five minutes before departure. The journey to Yeovil Pen Mill thankfully went without any hitches and I was able to see where the line side fire was just after ? tunnel on an embankment. I've no idea why it caught fire as it hasn't been that hot and people can't throw cigarettes from trains anymore. Yeovil Pen Mill is an unusual station with a double platform on a single track, though of course the guard only lets you out on the left. I then got a taxi up to Yeovil's football ground and back to Yeovil Junction, which is right out in the countryside, and a great example of a lovely country junction station. I had a cup of tea for just 60p at the nice station buffet there before getting the 16.40 to Exeter Central. It was then a quick hop to St James' Park, which must have one of the shortest platforms in Britain. Quickly took some pictures of Exeter City's ground, whilst it was still light, before going back into Exeter and my B & B. By the way the return fare from Exeter Central to St James' Park is a mere £1. About half an hour later caught another train back to St James Park for the game between Exeter City and Swindon Town. The return train leaves St James' Park at 21.27 so it means missing the last 10-15 minutes of the game, or wait another hour. I passed on that. but I did see a handful of fans leaving at twenty past nine! 29/3/11 Exeter St Davids to Plymouth and return. Exeter St Davids to London Paddington. London Fenchurch Street to Leigh-on-Sea. Before returning to Southend I make a quick visit to Plymouth getting the 08.13 from Exeter St Davids. As the train is going to Penzance I'm expecting it to be a HST, but it ends up being a Class 150 unit from Bristol, with just two cars, coming from Bristol Temple Meads. It's not too crowded and I get a seat OK, but from Newton Abbot onwards it's standing room only.. I speak about this with a First Great Western employee who tells me that sometimes they put another couple of carriages on at Plymouth, which by then is a waste of time, as mosr people get off at Plymouth! It's pouring down at Plymouth, so I get a taxi up to the ground. I take some photos and then get a bus back to the station. I then take the 10.42 back to Exeter, which is going all the way to Paddington, but I can't stay on it as the fare was much more expensive than the train I get ten minutes later. It comes from Paignton and still goes to Paddington, but stops at virtually every station between Westbury and Reading and takes about three quarters of an hour longer than the other train! 5/4/11 Leigh-on-Sea to London Fenchurch Street. London Kings Cross to Halifax. Halifax to Hebden Bridge. Hebden Bridge to Accrington. I was meant to get the 13.33 Hull Trains service up to Doncaster, but when I got to Kings Cross it said "delayed" on the board. It turned out that it had broken down and wouldn't be arriving until 14.44! In the end I caught the 14.20 Grand Central train which I was going to get on at Doncaster, only the Hull Train was only £20. The guard took pity on me and only charged me £32.50 all the way to Halifax, which was slightly cheaper than I would have paid with the single from Doncaster! The main reason for going on Grand Central was to go on the rare section of track between ? Junction and Knottingley that no other passenger train goes on. 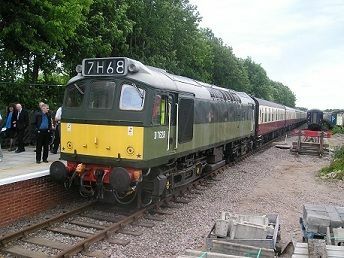 From the May 2011 timetable the route will change, cutting out the stop at Pontefract Monkhill. When we got to ? junction just west of Halifax, we were ten minutes early, but we had to wait for two trains going either way. I had two minutes at Halifax to catch my connecting train to Accrington. There was a train waiting in the other platform, but it had York on its headboard. In fact all the trains were up the creek because of a points failure at Sowerby Bridge, coupled with a theft of signalling cable in the Leeds area. There was no information on my 17.24 Blackpool train on the indicator board, so I took the risk of getting the next Manchester train out as far as Hebden Bridge. There I was told that my 1724 train would be in tn minutes latter, so instead of getting to Accrington, at 18.06, I got there at 18.30 and went to the Accrington Stanley vs Southend United football match. 6/4/11 Manchester Piccadilly to London Euston. London Fenchurch Street to Leigh-on-Sea. After staying overnight in Lancashire, I came back down to Essex the Wednesday afternoon. 16/4/11 Leigh-on-Sea to London Liverpool Street and return. London Euston to Wolverhampton. Wolverhampton to Shrewsbury. Shrewsbury to Birmingham New Street. Birmingham New Street to London Euston. Went to the Shrewsbury Town vs Stockport County football match. No problems getting there and back by train. Instead I had problems getting to and from the ground from gteh station, which is about two miles outside the town centre, such was the infrequency of the buses, so I missed the first five minutes of the game. 23/4/11 Leigh-on-Sea to London Fenhurch Street. London Euston to Manchester Piccadilly via Crewe. Rochdale to Manchester Victoria. Manchster Piccadilly to London Euston via Stoke-on-Trent. Upminster to Leigh-on-Sea. My final game of the season and final ground of the 92 was Rochdale. Going up was fine, but coming back was a nightmare. My Virgin train from Manchester was delayed on the way up and so didn't leave until 18.50 instead of 18.30. Then it was half an hour late getting into Euston. I should have got the 21.40 train from Fenchurch Street and been home by half ten. Instead there were no trains running from Fenchurch Street to Southend due to overhead line problems between Barking and Upminster. So we were told to go on the tube to Upminster. At Upminster there were no Southend trains, yet after about twenty minutes one did arrive from Southend. We all got on it expecting it go go, but instead it sat in the station for over an hour and didn't leave until just after midnight! The worst ever disruption I have experienced on c2c. I did write to the managing director of c2c, Julian Drury, with a list of my complaints. to be fair to him, he did write back to me aplogising for the disruption and giving me £30 worth of rail vouchers, so it does pay to complain if you've got a gripe. 11/5/11 Leigh-on-Sea to West Ham. Stratford to Highbury & Islington. Highbury & Islington to Whitechapel. London Fenchurch Street to Leigh-on-Sea. Went on the new line that goes from Highbury & Islington to Dalston Junction. It looks like the terminal part of Dalston Junction station is not going to used much as virtually all the trains now go via the through platforms to the right of the terminus platforms. 19/5/11 Leigh-on-Sea to London Fenchurch Street and return. Went up to London for the evening to see the Monkees at the Royal Albert Hall. No problems going, but for some reason the scheduled train we got home, went via Dagenham to Pitsea, stopping just once at Grays. 25/5/11 Leigh-on-Sea to London Fenchurch Street and return. Went up to islington with my work. Went on my first rail tour for over a year - partly because of financial constraints and partly because of nothing suitable being organised by the rail touring companies. 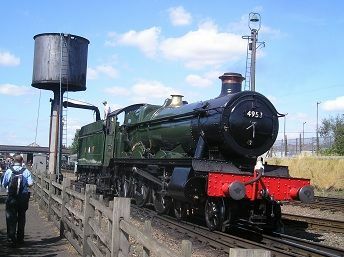 I was attracted to this one as it went via the Ivanhoe Line from Leicester to Burton, then on the Derby by-pass line, and finally via Corby and the Harringworth Viaduct. All new pieces of track for me. 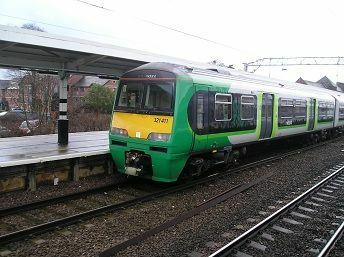 I stayed overnight in St Albans and caught a 1st Capital Connect train from there to Bedford, rather than get up very early to catch the train from Euston, which went via Bletchley and the Marston Vale Lne. The train was pretty full and had eleven carriages I think. This caused problems thanks to Health and Safety as it wasn't allowed to go all the way to Ruddington station, with its short platform, and had to be split at Rushcliff Halt. Half the passengers had to get off here and go by bus to Ruddington, whilst the rest including me, were hauled by Rat, D7629 to the short platform at Ruddington. The Norttingham Transport Heritage Centre there has plenty to see, including various preserved steam, diesel and electric locos, plus buses, model railways and narrow gauge railways, which most of us went on. We stayed for about two hours there, which was about right with time to explore the site, take photos and ride on the different narrow gauge trains. My only complaint was that they didn't have a licensed bar there, as I am sure they would have done a good trade with all those thirsty railway enthusiasts about. There are plans to build a bridge above the Midland Mainline at Loughborough and unite the two separate sections of the Great Central Railway into one sixteen mile super-preserved line, eventually linking Leicester with Nottingham. Coming back, we were about ten minutes late arriving at Bedford and I missed my 1st Capital Connect train by seconds, so it meant a half hour wait till the next one. The only black mark on an otherwise enjoyable day. 21/6/11 Leigh-on-Sea to London Fenchurch Street. London Paddington to Cardiff Central. Cardiff Central to Ebbw Vale Parkway and return. 22/6/11 Cardiff Queen Street to Rhymney and return. Cardiff Queen Street to Treherbert. Treherbert to Pontypridd. Pontypridd to Merthyr Tydfil. Merthyr Tydfil to Abercynon. Abercynon to Aberdare. Aberdare to Cardiff Central. Cardiff Central to London Paddington. London Fenchurch Street to Leigh-on-Sea. Bought a Valley Lines day Rover ticket for just £9.10 and managed to complete thee missing lines, before returning to Essex. the thing that struck me was the way Arriva Trains are so efficient at running all the different trains through Queen Street and Cardiff Central. Plus they make sure that all trains have guards checking tickets. The other thing that struck me was the complete lack of graffiti on the Valley Lines. None on the trains, stations or buildings. Either the youth of the Valleys aren't into graffiti, or someone in wales is doing a great job in keeping the region graffiti free. The only negative thing that happened during the day was the first train I got – the 09.20 from Queen Street to Rhymney was delayed by ten minutes due to a theft of cable from further up the line. The driver did manage to make up most of the time on the way back, otherwise my whole schedule could have been put out and I might not have been able to complete it all, which I did manage to do. So managed to travel on all the Valley lines in one day. Then caught the 16.55 back to Paddington. 13/7/11 Leigh-on-Sea to London Fenchurch Street and return. Moorgate to Alexandra Palace. Alexandra Palace to Hertford North. Hertford North to Hitchin. Hitchin to Cambridge. Cambridge to London Liverpool Street. Went on these lines to cover the Hertford Loop for the website. I had been along this line in 2009, but on a diverted train which went so quickly along it, that I couldn't take it all in. This time I got a stopping train up to Hertford North and then waited twenty minutes for the hourly train through to Stevenage. As I has got that far, I decided to go up to Cambridge via Hitchin as I hadn't travelled on that line since the 1970's. I also reviewed that line for the website. Then after a break at Cambridge I came back on a nice Stansted Express unit down to Liverpool Street. A nice train inside, but a very bumpy ride! 24/7/11 Leigh-on-Sea to London Fenchurch Street. London St Pancras to Loughborough. Loughborough to Sheffield. Went up to Sheffield to see Iron Maiden at Sheffield Arena. On the way up got off at Loughbrough to pay a visit to the Great Central Railway. Unfortunately it was a special event day - Mail by Rail - so I had to pay £18 for just one round trip to Leicester North and back. All the stations are beautifully restored, though its claim to be Britain's only double track preserved line isn't quite true. It is double track from Loughborough to Rothley, but the line between Rothley and Leicseter North is single track. Still it was nice to see a Brush 4 go past on a freight working, as well as other steam hauled trains. I was pulled both ways by Great Western 4-6-0 Pitchford Hall, though there were plenty oi other preserved locos to see including a Class 31 in an orange looking livery, a class 24 and a Peak hidden away in their shed at Loughborough. If they do eventually join up with the Nottingham branch of the GCR, the shed will have to be moved somewhere else, as it is right in the path of the tracks going north! 25/7/11 Sheffield to London St Pancras. London Fenchurch Street to Leigh-on-Sea. Came back the next day without any problems. Went up to London on a family trip to Wembley Stadium. Went there on the Metropolitan Line, but was hoping to come back from Wembley Stadium station into Marylebone. Unfortunately, not only was the station closed but so was the whole line into Marylebone, so it was back into London on the Metropolitan line. 9/9/11 Leigh-on-Sea to London Fenchurch Street. London Paddington to Chippenham. Chippenham to Salisbury via Melksham. A trip with three aims:- 1) To go to the Swindon Town vs Southend United game; a ground I haven't visited since 1977. 2) To go on the Melksham Line between Chippenham and Trowbridge, which at present only sees two rains a day in each direction. Even then on weekdays these are timed at inconvenient times for the average passenger - about 7 o'clock in the morning and 7 o'clock in the evening. I choose to get the 7.01 pm service from Chippenham straight through to Salisbury, where I will stay the night. Which brings me to 3) To cover the track between Salisbury and Bath, which means I will have completed the whole of the old Western Region area. I leave Leigh-on-Sea just after 2.00pm to get to Paddington in time to catch the 4.00pm to Chippenham. This was the best deal farewise, so it meant hanging around Chippenham for about an hour and a half. My train was delayed in the Slough area for some reason - we had to change from the fast line to the slow line and then back again - so I was about fifteen minutes late arriving in Chippenham. I then walked round the town centre which didn't take long, before finding a Weatherspoons type pub called the Brunel, right next to the railway line, which served real ales and food. Getting back to the station I found that my 19.01 train to Salisbury was delayed, so it didn't arrive till nearly quarter past seven. It turned out to be a Bubble car and was over half full and well used, especially at Westbury and Salisbury, but the driver did make up time in the end. It actually continued onto Southampton, so perhaps there is a case for making this train a regular cross country service. By the way my fare from Chippenham to Salisbury was a mere £3.50, working out at under a penny a mile - surely one of the cheapest rail fares on the rail network. 10/9/11 Salisbury to Bath Spa. Bath Spa to Swindon. Swindon to London Paddington. West Ham to Leigh-on-Sea. The next morning I got a First Great Western train from Salisbury, (one of my favourite mainline stations on the rail network) all the way through to Bath. It consisted of three carriages and was about three quarters full when I got on it. After Westbury it was standing room only. There was a group of Brighton fans on their way to Bristol and they had to be told to stop swearing by the guard. As the train filled up they began to quiet down and even gave up their seats for some elderly passengers! I then spent a pleasant two hours walking round Bath, a city I hadn't explored since my childhood. Then it was back on the train to Swindon and the Swindon vs Southend football match. Southend lost 2-0 and I left before the end to catch the 17.11 train back to London. Only when I got there at five past five the 16.39 to London was only just coming in. As it stopped you could see that one of its windows had been smashed and everyone was told to get off and get my train, whilst they mended the window. Then a freight coal train came in on my train's platform, delaying things even further. Then a Cheltenham train came in. Then the passengers were told to get back on their delayed train as the window had been mended.Then at last my train came in about half past five. Needless to say I would miss the 7.00pm train I was going to get from Fenchurch Street back to Southend. Instead I stayed on my Hammersmith and City line tube all the way to West Ham, where I was able to arrive just before the 7.10pm train came in, which I wouldn't have caught if I'd changed at Liverpool Street onto a Circle line train. 10/10/11 Leigh-on-Sea to London Fenchurch Street. Farringdon to Luton Airport Parkway. Paisley Gilmore Street to Gourock. Gourock to Port Glasgow. Port Glasgow to Wymess bay. Wymess Bay to Glasgow Central. Went up to Glasgow for a few days to complete as many of the unchartered branches as possible, after June's visit to Cardiff and the Valleys. Flew up with Easy Jet from Luton as much cheaper and quicker than by Virgin. 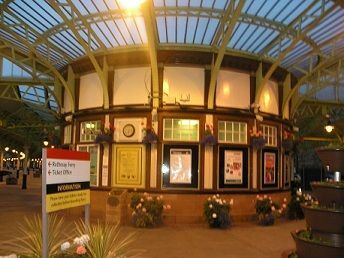 As the airport was near to Paisley went on the Gourock and Wymess Bay branches as I had missed those three years ago, when I went to Largs. The only problem was that as it was raining, by the time I got to Wymess Bay the light was fading rapidly and so my photos weren't as good as they could've been if it had been sunny. On the way back we were held up for twenty minutes on the crossover between Inverkip and IBM waiting for the train coming towards us. I don't know what the delay was, but we were over quarter of an hour late getting into Glasgow Central. 11/10/11 Glasgow Central to East Kilbride and return. Glasgow Central to Neilston. Neilston to Mount Florida. Mount Florida to Newton. Newton to Motherwell via Hamilton. Motherwell to Lanark via Wishaw. Lanark to Motherwell via Wishaw and Holytown. Motherwell to Dalmuir via Bellshill and Rutherglen. Dalmuir to Balloch. Balloch to Westerton. Westerton to Partick, Glasgow Subway. Partick to Charing Cross. Using an SPT day Tripper card for just over £10 I was able to complete five branches today. Was going to do Whifflet as well, but decided to leave that and go on a quicker trip round the Glasgow Subway to end the day. The day started off well with the 08.48 to East Kilbride and back. I had eight minutes at Glasgow Central, before getting my next train to Neilston. When I saw that it was a Class 314 unit without any toilets on it, I quickly jumped on a new Class 380 unit on the next platform to use the toilets. As I shut the toilet door the doors of the train shut! So I quickly rushed out to see no one on the train and a possibility of going on an empty train to Shields Road Depot! Luckily a female inspector saw me and got the driver to open the doors. I still made the Neilston train with seconds to spare, so my schedule was not put out of place. At Neilston station they did have a toilet, in spite of it being a small place in the middle of nowhere. Everything else went to schedule and I was back at my hotel by 5.00pm, tired but glad that I had managed to fit in so much. 12/10/11 Glasgow Central to Stranraer. Stranraer to Ayr. Ayr to Prestwick International Airport. Stanstead Airport to Harlow Town. Harlow Town to London Liverpool Street. London Liverpool Street to Stratford. West Ham to Leigh-on-Sea. Got up very early to get the 06.30 to Stranraer from Glasgow Central via Kilmarnock, where the train reversed. It was a pleasant journey on a fairly empty two-car Class 156 DMU, complete with snow ploughs. After Girvan, the train had just six passnegers on board, including me. It went across a large expanse of moorland, similar to the Far North line and stopped at Barrhill, one of the most remote stations in Britain. At Stranrear it waited about forty five minutes, so I went into the town for a bit. The tragedy of this line is that from November Stenna will not be using Stranraer any more as a port for their Northern Ireland ferries, but transferring their service up the coast to Cairnryan. I can see a possiblity of this line shutting sout of Girvan as there just won't be the passengers using it any more. 12/11/11 - Leigh-on-Sea to London Fenchurch Street and return. Wembley Stadium to London Marylebone. Went to London to see the England vs Spain football match at Wembley Stadium. Sriived on the Jubille Line but decided to go back to London on the Chiltern Railways service from Wembley Stadium Station. Left a few minutes before the end, but even then there were queues at the station entrance for fans going northwards towards Brimingham. I got onto the platform straight away where a six car train was waiting, but it was standing room only. It soon left and took just seven minutes to get to Marylebone. Surprisingly it came into the shorter platform 4 rather than the longer platform 1 or 2. this meant a lot of people running to get to the ticket barriers before it got too crowded. Even then there was a bit of a scrum, but apart from that a very easy and quick way to get away from Wembley Stadium on event days. Went up to London to visit a friend. On the way went on the recently opened DLR line extension on the old route to North Woolwich. Went first from West Ham to Canning Town and then back up to the terminus at Stratford International. 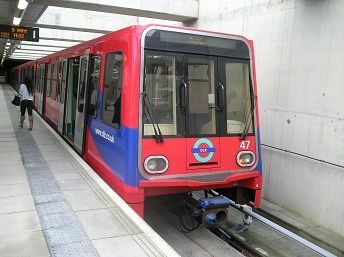 The final section takes you right past the Olympic Stadium on the London Overground line and then over the HS1 line. In fact Stratford International is nearer the Olympic Village rather than the stadium, so it would be better to get off at Stratford station if you're going to the Olympics. Went just four days later up to London to see another friend in London. 3/12/11 - Leigh-on-Sea to London Fenchurch Street and return. London Bridge to East Croydon and return. East Croydon to Brighton and return. Brighton to Falmer and return. I caught the 11.22 train from Leigh into Fenchurch Street, then a tube to Monument, followed by a brisk walk across the river Thames to London Bridge station. I then got a train as far as East Croydon, where I got off to buy a ticket to Brighton. You see it was cheaper for me to buy a travel card which covered the London part of a journey, and then a return to Brighton from East Croydon, rather then a return from Leigh to Brighton. It was then a forty five minute journey on a stopping Thames Link train, getting me into Brighton at 1.50pm. As I got off the train it so did lots of Brighton fans, and then there was a massive queue of even more fans waiting to get the train to Falmer that I had to pass through to get my ticket. Luckily there was a ticket inspector selling tickets, so I didn't have to queue up for long. Then I sneaked in the even longer queue to get on the Falmer train, but no one complained. I was hoping to get the 14.02 train but such was the sheer numbers of fans that we had to wait for the next one, which left at 14.10. We were herded between a set of barriers which I suppose was the only way they can cope with such high numbers. It was never this bad going to Withdean! I got in the first carriage (of four - why not eight? ), which wasn't even full, but at the first stop, London Road, even more fans got on, and from then on it was standing room only. There was one more stop before Falmer and then virtually everybody got off the train. The problem here is that it was once a small suburban station, not built for such high numbers, so we all have to funnel through the station entrance to get to the specially built walkways that take you over the lines and to the ground which is just up the hill from the station. Coming back I left before the end but was able to get onto the platform to catch the 17.02 train from Falmer which again was just a four car train. As we left you could see hundreds of fans queuing up to get onto the following trains. No one checked our tickets going or coming back by the way. I then stayed on in Brighton going to a gig to see Wishbone Ash playing before catching the non-stop 21.50 train to East Croyon. Such were the connections that arrived back in Leigh-on-Sea just before midnight, just over two hours since leaving Brighton. Had to go up to Liverpool with my job. For some reason when I booked I was given a train that meant changing at Crewe both going and coming back, rather than a direct train. I didn't mind as waiting at Crewe brought back memories of train spotting there in the 1970's, although the trains are not as interesting as back then, Crewe still holds some of that magic that it had all those years ago. When I got to Lime Street it was a quick change of platforms with a six minute change over time as I was able to get the hourly train direct from Liverpool to Warrington Bank Quay. This goes through part of the triangular Earlestown station, which was new track to me. (This is only one of a handful of triangular stations on Britain's railway network - the others being Shipley and Dinting as far as I know). Coming back I came through the other two thirds of the triangle by going to Newton-Le-Willows and then changing there to get a Liverpool bound train. This turned out to be a pacer with hardly any leg room and no head rest, which stopped at every stop, so not a very pleasant journey. In the evening I went over to Birkenhead to see some friends on the Wirral section of the Merseyrail line, which involved a wait of over five minutes both times, despite the fact that there are four potential destinations for trains on this route. 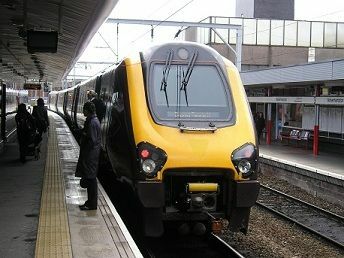 8/12/11 Liverpool Lime Street to Crewe. Crewe to London Euston. London Fenchurch Street to Leigh-on-Sea. My return journey was pretty uneventful, and again involved changing at Crewe to get one of the every twenty minutes through train from Manchester Piccadilly to London, as opposed to an hourly through train service from Liverpool Lime Street. 16/12/11 Leigh-on-Sea to London Fenchurch Street and return. London Waterloo to Wimbledon. 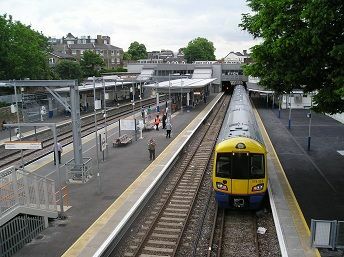 Wimbledon to Epsom and return. London Kings Cross to Hatfield and return. Had to go to various places around London with my work. 19/12/11 Leigh-on-Sea to London Fenchurch Street and return. West Hampstead to Norwich via Hertford North and Cambridge. Norwich to West Hampstead via Cambridge and Tottenham Hale. 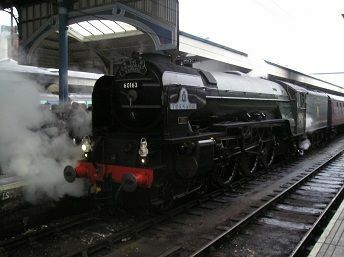 Went on a Steam Dreams tour to Norwich from London pulled by Tornado to celebrate my 30th wedding anniversary. We had the full works with breakfast and dinner in First Class. The train ran more or less to schedule and as it was Tornado, was filmed and photographed by hundreds of enthusiasts all along the route.